10 week old GSDxRR mix - DS lump visible, the tube was palpable at three days of age. Bliksem lived with me until his death in May, 2004. He was 10 years of age. 8 week old PitbullxRR mix - DS found in the tail area. 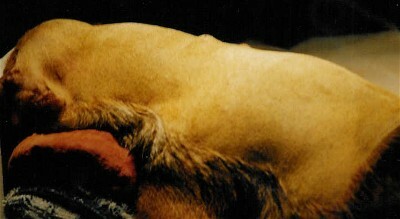 This dog had several removed and later had his tail amputated due to the DS regrowth. Brodie lives in Marin county. Two distinct DS “holes” which are actually the exits of the Dermoids - Shadow is living happily with her family in California. One year old LabxRR mix. The shelter vet told me that this lump was simply a vaccine reaction. The DS was successfuly removed a few weeks later. 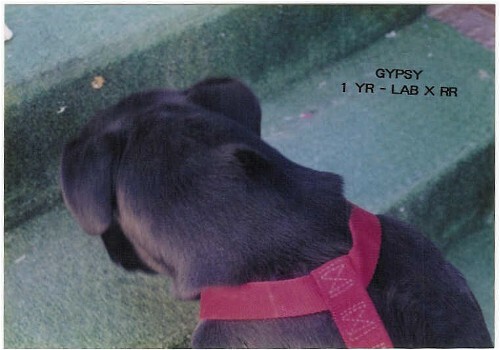 Gypsy went to live with afamily in LA.